On March 27th, 1977, a Boeing 747 of KLM Royal Dutch Airlines collided fatally with a 747 of Pan American Airlines on the runway of Los Rodeos International Airport on the Canary island of Tenerife. Five hundred and eighty-three people lost their lives; only 61 survived the air disaster. On March 27th, 2007, 30 years after the disaster, a first time ever official international memorial service for the largest aviation disaster in history was held on the initiative of the Foundation for the Surviving Relatives of the Tenerife Disaster. The international commemoration consisted of two parts: a memorial service and the unveiling of an international monument. The memorial service was held at the Auditorio de Tenerife in the capital Santa Cruz; the unveiling took place on Mt Mesa Mota in the municipality of San Cristóbal de La Laguna. The ceremonies were attended by Dutch and American next of kin and survivors, as well as Spanish aid workers and others who were involved in the disaster. The monumental art work by renowned Dutch artist Rudi van de Wint, who suddenly died in May 2006, is an 18-metre spiral stair case, named Stairway to Heaven, of which the steps appear to move endlessly upward into infinity, but are cut off suddenly. The monument, situated in a breathtaking location on Mount Mesa Mota, is fitting and inspiring. It is a monument of which we can be proud, and which honors the victims. Something terrible happened at Los Rodeos on 27 March 1977, which may have lain hidden for 30 years. It is important that justice is done to this disaster. The worst aviation diaster in history will no longer escape anybody’s notice. The monument gives us, the next of kin and survivors, and also all others who were involved, an opportunity to commemorate the disaster and find inner peace. At 17.06, the exact time of the disaster, those attending the unveiling of the monument observed two minutes of silence. 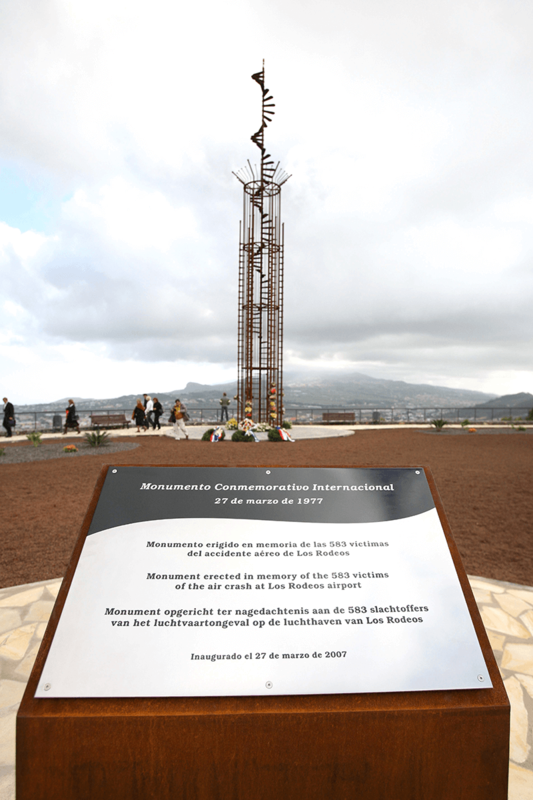 The Foundation for the Surviving Relatives of the Tenerife disaster has achieved its objective: a monument for all victims, for everyone involved. The monument for the victims of Tenerife is a sculpture which is a spiral staircase, and a spiral staircase which is a sculpture. The spiral theme is a symbol of infinity. The sculpture will not be immediately recognized as such, and yet neither is it in practical terms a staircase. There is no banister, and the steps are not intended to be used. The 18-metre-high sculpture is not what it seems, which is emphasized by the 12-metre-high fence that has been placed around it. The transparent fence encloses and protects the sculpture. Rudi van de Wint once said: people either like or dislike a monument, but a monument is about so much more. The ritual significance of the location is of prime importance. Monuments are often places of yearning; they are projections of impotence, of the brokenness of the human spirit and of the universal drama. A monument which encapsulates a yearning for reconciliation or acceptance can never be too sober, because the real drama cannot be expressed in art. Art can only provide a subtle hint. For a moment, the sculpture appears to move endlessly upwards, but the spiraling movement of the steps has been abruptly interrupted. It can be seen as having an open ending, but also as a never-ending motion. It appears to be an unfinished form, cut off suddenly, like the victims lives. But the staircase, high up on the mountain, also makes minimal contact with the sky above, with the infinite star-spangled heavens which it appears to touch ever so briefly. A commemorative booklet has been published as a keepsake of the international commemoration and the unveiling of the International Tenerife Memorial on 27th March 2007.